Everyone has time in his or her schedule for better health. It should not be an afterthought, it should be a priority. Let's face it, most of us are extremely busy, and performing a workout routine at 6am or after a stressful day of work is just not going to happen. It is tough enough to balance work and family time in the course of a day. How can we possibly work out when we have more important things to do? Working out becomes something we would like to do but is blown off with the simple excuse of,"I just don't have the time." Everyone has time in his or her schedule for better health. It should not be an afterthought, it should be a priority. I think we can all agree that living a long, healthy life is something we should all aspire to do. Well, you're not going to achieve that goal thinking about working out. You have to make a concerted effort to eat healthy and make working out part of your daily regimen. always say, the choices we make dictate how we are going to look and how we feel. For many of us, lunch-time is the onetime of day that we have the energy to train. The morning blahs, 3 p.m. low, and after-work blues just have never panned out as good times to train. The one hour that you have for lunch can be the time that you take every day to sculpt muscle and burn fat. Instead of thinking about it, you can make all those goals a reality by taking your lunch break at the local gym. I am sure you can find somewhere to work out within a 5 mile radius of your office. Now, I know a lot of you are saying, "OK, I will work out, but when am I going to eat?" Living a healthy lifestyle does not include skipping meals. Many gyms are equipped with food and/or juice bars, so you can have a smoothie, meal replacement shake, bar or one of the healthy meals they have available. If your gym is not equipped with a juice bar, then simply bring a healthy sandwich with you and eat it after you train. A 1-hour lunch break does not mean you can work out for an hour. You have to factor in the time it takes to get to and from the gym and the quick shower after you're done training. In reality you have about 30-35 minutes to train. That is more than enough time to get an effective workout in. You won't be able to do some elaborate championship bodybuilding routine, but nevertheless, you will be able to perform the basics. Being that you are under a time crunch, I believe it is best to do cardio and weight training on different days. There are hundreds of ways you can structure your routine. The following week of training do lower body on Monday and Friday and upper body on Wednesday -alternate weeks. 2 sets of 12,6 reps. No rest between sets. Rest 30 seconds before starting pull-ups. 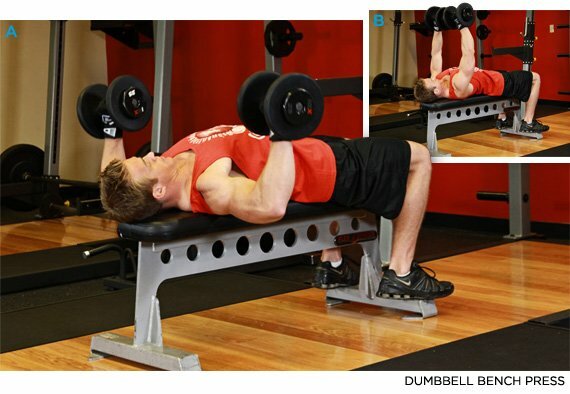 Execution: Pick up the dumbbells, keeping your feet flat on the floor, and lie back on the bench. Press the weight up while you breathe out, and then lower it back down slowly. Repeat. Quicktip: Don't lift the weight over our face or stomach; the weight should be over the collarbones. 2 sets to failure. Rest 30 seconds between sets. 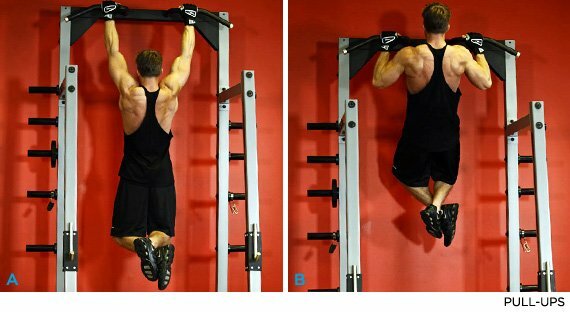 Execution: Grab the chin-up bar with an over-hand grip (palms facing bar) and your hands just beyond shoulder width apart. Pull yourself up and try to touch your chin to the bar. Return slowly to the starting position and repeat until failure. Quicktip: Make the connection with your mind; try to visualize and mentally focus on your back muscles as you are pulling your body up. 2 sets of 12,6 reps. No rest between sets. Rest 30 seconds before next exercise. 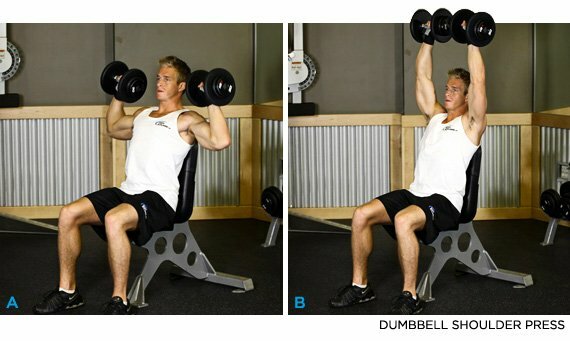 Execution: Position the dumbbells to each side of your shoulders with your elbows below the wrists. Press the dumbbells upward until your arms are extended overhead (don't fully lock elbows).Lower to sides of shoulders and repeat. 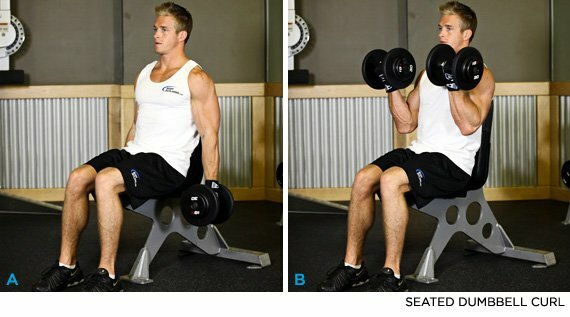 Note: The next three exercises are done in the seated position, on the same bench. This is a great way to save time. Quicktip: Keep your feet firmly on the ground and don't use body momentum to raise the dumbbells overhead. 2 sets of 12,6 reps. Execution: In a seated position with your feet on the ground and back firmly against the bench pad, take one dumbbell, place both hands under the top plate, lower the dumbbell back to full extension until the forearms hit the biceps, and raise back up. Quicktip: This is not a natural movement; use good form, try and keep your back straight and your neck still. Execution: In a seated position with your feet on the ground and back firmly against the bench, with a dumbbell in each hand, slowly curl the dumbbell in your left hand up and try to touch it to your left shoulder. Squeeze and contract the bicep for a one count and slowly lower the dumbbell to the start position and repeat with your right arm. 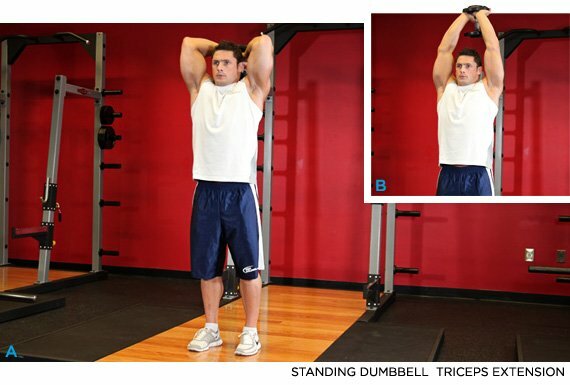 Quicktip: Keep your shoulders, spine and entire body straight during the exercise. Execution: Crunches can be done on the floor, an exercise bench or ball. Place your hands behind your neck or across your chest; flatten your lower back against bench, curling your head and upper torso up several inches off the bench until your abs are fully contracted. Squeeze and contract your abs for a one count and slowly lower your torso back until your shoulders just about touch the bench. Breathe appropriately. Quicktip: Don't worry about repetitions, focus on form. Make sure you are squeezing and contracting your abs on every single rep. Make one rep equal two. 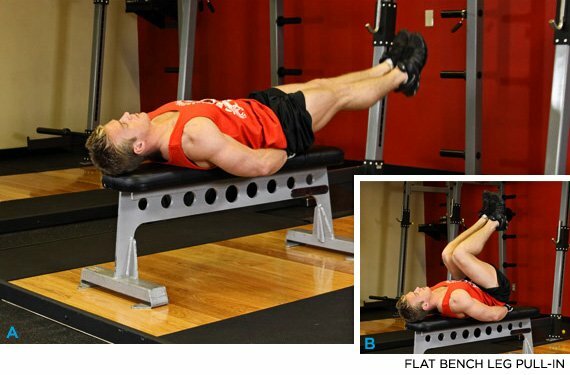 Execution: Sit on the end of a flat bench and lean your torso back to a 45-degree angle to the floor. 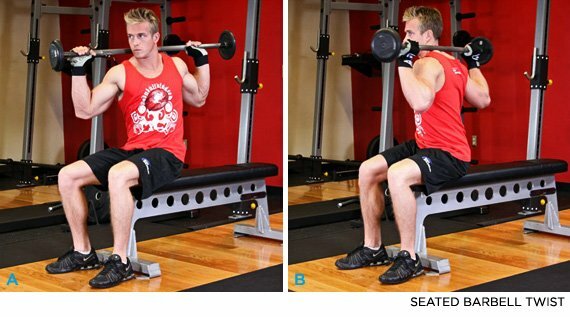 Extend your legs out at a 45-degree angle and stabilize your body by gripping the sides of the bench or chair. Pull your knees into your chest and then lower your knees back down to the starting position. 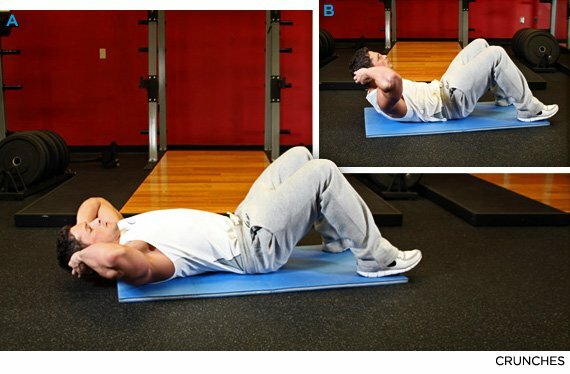 Quicktip: Focus on the lower abdominals when you perform this exercise. Feel the lower abs contract and stretch throughout the movement. Execution: Sit on the end of a bench; place your feet flat on the floor and about shoulder width apart. Place a light bar across the back of your shoulders and hold it while keeping your head stationary. Turn your upper body and shoulders in one direction as far as you can, then turn your torso and shoulders back in the other direction as far as you can, keeping the movement fully under control while getting a full stretch on both sides of your body. Quicktip: Use a light bar or broom; using heavy weights for this exercise could lead to a serious injury. Follow this workout or any other, just get to the gym and start moving. The hardest thing in the world is getting started; it is hard to break patterns, but once you make a 100% commitment to a fitness lifestyle, you are going to love the way you look and feel. Isn't that worth giving up an hour a day for?